August 19, 2016 — Downtown Alameda Business Assn. Back-to-school shopping can be daunting. Whether you’re shopping for an elementary student, middle-schooler, high-schooler, or college student, back-to-school shopping means stocking up on school supplies. Instead of going back to the mall or driving to the big box stores, take a relaxing stroll through Downtown Alameda where you are sure to find everything you need to make this the best school year yet! Basic School Supplies – The essential school supplies include paper, pencils, pens, rulers, markers, notebooks, lunch boxes, and bags. You’ll find all of these items and more at neighborhood convenience stores and pharmacies in Downtown Alameda. CVS Pharmacy – Name brand school and office supplies. Clothing and Shoes – To make sure your child starts the school year in style, drop into one of Downtown Alameda’s clothing shops where you will find the latest apparel for fashion-conscious kids — everything from trendy shoes to socially aware t-shirts. On a budget? You can also find gently worn fashions at the re-use boutiques. Doumitt Shoes – Trendy, fashion shoes for the entire family. District Footwear & Apparel – The latest in metro-hip sneakers and apparel. Lauren’s Closet – Clothes, accessories, and more for children and juniors. All Good Living – Lifestyle clothing that is earth-friendly and made in the USA. Computers & Electronics – Whether it’s new phones to stay connected with the kids, new computers to help with completing homework assignments, and or calculators for fun and learning, you’ll find a number of retail shops in Downtown Alameda that offer the right gadgets to help students get through the school year successfully. Quick Communications – Verizon Wireless Authorized Exclusive Retailer. Grand Communications – MetroPCS Authorized Dealer. ABM Computers – Vast array of hardware and software solutions. November 18, 2015 — Downtown Alameda Business Assn. Downtown Alameda has a terrific collection of shops and restaurants. Did you know that by shopping or dining at a small business in Alameda, you’re not only showing your support for local businesses but you’re also investing in this island community, helping to preserve Alameda’s unique charm. When shopping local, a greater share of every dollar spent is recirculated into the local economy. Be an Alameda Island Shopper! This is your local one-stop-shop for children’s clothes, accessories, and toys. They carry a great selection of both new and used items to meet every budget. This specialty store features everything that earth-concious parents need to go green with their new baby or toddler: feeding accessories, clothing, diapering solutions, toys, and much more! Tot Tank is your neighborhood infant gear and juvenile products store. In addition to parent “must-have’s,” they have a full inventory of toys and activities including brands such as Alex, Melisaa & Doug, Green Toys, Fisher Price, and more. Toy Safari strives to create a magical atmosphere that engages the imagination. They carry toys that light up the eyes of kids of all ages. You’ll find an enormous inventory of new, used, and collectible toys at this popular toy store. May 28, 2015 — Downtown Alameda Business Assn. The Alameda Theatre & Cineplex starts its Summer Family Movie Series on June 16. One kid movie favorite will be shown each week on Tuesdays and Wednesdays at 10:00am in the historic theatre. This year’s Summer Family Movie Series features How To Train Your Dragon, Rio 2, The Box Trolls, Night at the Museum: Secret of the Tomb, and six other popular G-rated films. You can purchase the whole series of 10 family movie tickets for $10 per person. Otherwise, single tickets will be available on the day of the show for $2 per person. This is not only a super fun outing for the kids but it’s also a fundraiser for local schools and youth organizations. Twirl is Alameda’s newest design lab and play gallery for kids. Younger children can take a ride on the tike track, climb through the tree house, build a fort in the construction zone, or snuggle up and read in the book nook. The studio is open for all ages with things like pottery wheels, glass painting, playdough experiments, and papercutting workshops. Different activities are available each week. Drop-in admission for unlimited play is $12 per child. Special classes are also offered on a sign-up basis. May 29, 2014 — Downtown Alameda Business Assn. The Alameda Theatre & Cineplex starts its Family Summer Movie Series on June 17. One kid movie favorite will be shown each week on Tuesdays and Wednesdays at 10:00am in the historic theatre. This year’s Family Summer Movie Series features Despicable Me 2, Turbo, The Nut Job, The Lego Movie, and 5 other popular G-rated films. You can purchase the whole series of 9 family movie tickets for $9 per person. Single tickets are available on the day of the show for $2 per person at the Theatre Box Office. This is not only super fun for kids but it’s also a fundraiser for local schools and youth organizations. High Scores Arcade is the newest entertainment center on Park Street. The video arcade offers classic games of the 1980’s and 1990’s – all set to unlimited play! The arcade currently features 45 cabinets with over 400 playable classic games such as Tron, Star Wars, Pac Man, Donkey Kong, Centipede, and more. Cost is $5 for one hour or $10 for all day admission. What a terrific way to share a favorite pastime with the kids! Take the budding artist (age 10 and older) to Artistic Home Studio & Boutique to make AMAZING fused glass art — jewelry, suncatchers, nightlights, plates, bowls, and more! The studio provides the stained glass, tools, and kiln firing. They’ll even teach first-timers how to use the glass cutting tools and simple fusing techniques. Drop-in times are Tuesday through Sunday, Noon-5:00pm. There’s no studio use fee, you just pay by the piece. Artistic Home Studio & Boutique also offers summer camps for painting, mosaics, and glass art. Subpar Miniature Golf offers a one-of-a-kind indoor 18-hole mini golf experience with all your favorite Bay Area landmarks, from the Golden Gate Bridge to the Winchester Mystery House. The holes vary in difficulty from those that first-time golfers can find success on, to those that will challenge the older kids. Golf fees start at $5 for kids and $7 for adults on weekdays. In addition to mini golf, Subpar has air hockey, pool tables, and a mini arcade with pinball machines, skeeball, and modern video games. Have the need for speed? Then head over to the new slot car area and take some thrilling trips around the giant race track! During the summer, Subpar Miniature Golf opens at 11:00am on weekdays and 10:00am on weekends. D20 Games is a place dedicated to face-to-face play (not face-to-screen). They feature regular events for players of Magic the Gathering, Pokemon, and other strategy games in a friendly, fun, and comfortable environment. Two-Headed Giants is a GREAT way for parents and kids to play Magic as a team – the parent gets to play without needing to worry about “doing it wrong” and the kid gets to be the smart one for a change. D20 also has a great selection of quality board games for sale. They even do game rentals so that your kids can try it before you buy it. For the little ones that might be too intimidated by the larger race track, Homeroom Racing Cafe still has a shorter track for family and friends to challenge each other. You can find plenty of classes and summer camps in the Park Street Business District to keep the young ones entertained this summer… ballet, martial arts, home arts, music, sewing, and more. There are also numerous summer tutoring programs offered by the same folks who provide after-school programs. The Historic Park Street Shopping District offers great food & drink establishments, charming shops, friendly services, and fun things to do! 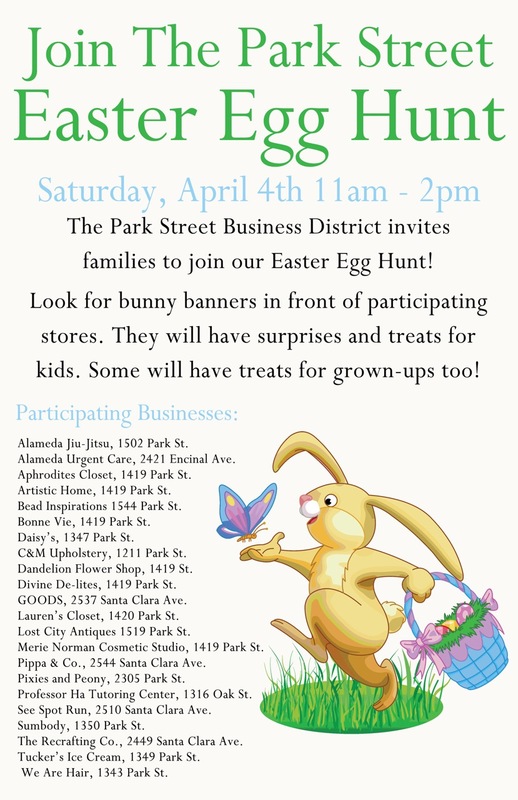 To learn more about the businesses and events in Downtown Alameda, visit our website: www.ShopParkStreet.com/news. You can also find the “Park Street Business Association” on Facebook, Twitter , and Google+.